Some dice games are just so playable that they have been commercially marketed, while other dice games, requiring specially marked dice, have also been developed and manufactured. Here you can find a whole range of commercial games that are played primarily with dice. Commercially manufactured dice games are listed with a brief description of the gameplay and history. Manufactured by Milton Bradley (or MB Games) and it's Lowe Division. Edwin S. Lowe introduced the game in the 1950s. A Canadian couple sold him the rights to the game after they had asked him to package a few as a gift for their friends. They said they invented the game while on their yacht and named it the Yacht Game. 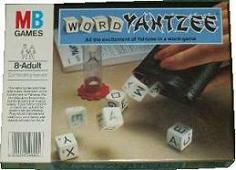 Edwin S. Lowe used the name Yahtzee instead and it is still commercially sold today. It is very similar to the traditional Puerto Rican game Generala played with five dice and categories like poker hands and triples or quads. Perudo is a commercial version of the game of Dudo or Peruvian Liar Dice. It was allegedly taught to the Spanish conquistador Pizzaro by the Inca King Atahualpa in the 16th century. This is the dice game featured in the film The Pirates Of The Caribbean: Dead Man's Chest. Cosmo Fry (known for Fry's Cocoa) marketed the commercial version of the game, Perudo, in 1990 in the UK. It included real leather dice cups and a traditional Peruvian dice bag and was consequently not cheap to purchase. The game is just as easily played with your own ordinary standard dice and throwing cups or beakers to roll and conceal the dice. Beetle was first marketed under the name Cootie by Shaper Toys in 1948. It was said to be the companies first attempt at producing games. A plastic flea was assembled from the parts supplied in the box according to the numbers thrown with a single die. They claimed it was educational, which is hard to see, but it makes for an entertaining pastime for very young children who can play it with pencil and paper and a dice. Today Milton Bradley manufacture and sell Cootie as their own. Farkle is a commercial version of the old traditional game of Ten Thousand. Marketed by Farkle Games Inc. in Texas, USA. It is in a long line of companies who have re-packaged the game and sold it as their own. There are specially marked dice manufactured for Farkle but it is best played with a set of six standard spotted dice and a score-pad. Many commercial versions of Ten Thousand have been marketed. Usually with a gimmick on the rules like wildcards or bonuses for combinations and totals. 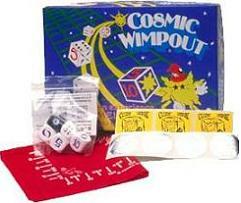 Cosmic Wimpout (1984, by Cosmic Wimpout) is a five dice version of the game played with specially marked dice. Kismet was first marketed in 1964 by Lakeside Games. E.William DeLaittre holds the trademark on the game which is currently produced by Endless Games. Sold as "The Modern Game of Yacht", it is very similar to the game of Yacht or Yahtzee, with a few variations on the rules. The main difference is that the faces of the dice have different coloured spots. Five dice are used and each is marked with a black 1 and 6-spot, red 3 and 4-spot, and green 2 and 5-spot. Like Yacht, you have to make poker hands and the different coloured spots are used to make things like flushes and pairs of the same colour. LCR is a dice game first published by George & Company LLC in 1992. The game package comes as a plastic tube containing three dice and a number of round chips ans is also available in a tin. It is really only a variation of the old standard ordinary dice game of Aces In The Pot. It is played by three or more players and is a game of luck involving only mechanical game play. Each dice is specially marked with the letters "L", "C", "R" and single small circular spots. The letters signify whether players pass chips to the left, right, or into the centre. There are many dice games that use different alphabetic letters marked on their dice. These games usually require players to make words in an anagram-making type game. This is a word game manufactured by Parker Brothers (1957) using fifteen dice marked with letters. Players have a time limit to make words from the letters thrown in a vertical/horizontal crossword type pattern. Egg timers are supplied. Points are scored for the number of letters used. This is a word game manufactured by the Lowe Division of Milton Bradley. Specially marked dice with alphabet letters and point values are used. Players score for categories and the dice include wildcards. This is a hidden word game manufactured by Parker Brothers, USA (1957) using specially marked dice which have letters and point values printed on them. The idea is to score as many points as possible by making words from sixteen letter dice which are randomly dropped into a grid. There's a three minute time limit using egg timers supplied with the game. Perquckey is an anagram-making game manufactured by Cardinal Industries, Inc. from Long Island City, New York. It was originally produced by The Shreve Company of Los Angeles, California, USA, before it was subsequently produced by Lakeside Toys, a division of Lakeside Industries based in Minneapolis, Minnisota, USA. 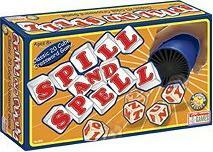 It is quite similar the anagram-making dice game Spill & Spell. Players (aged 7 and up) roll 10 or 13 dice, each with six letters of the alphabet printed on each face. They must then repeatedly rearrange the dice into as many words as they can within a specified time limit, reusing the same set of letters each time. Points are awarded according to the number of letters in each word and the number of words made. A timer is included in the game package. 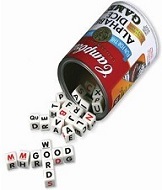 Campbells is a tinned soup manufacturer and they have used this aspect of their business in the theme for their dice word game, with rounds described as "servings", and their promotions describing it as "not just another alphabet game. It's M'mm M'mm GOOD. ", and with its packaging designed to look like a soup can, etc. Released in 2011, the game is manufactured by TDC Games from the USA and it comes with 36 dice with letters of the alphabet marked on their faces (216 letters altogether). It's gameplay is a cross with many other anagram-making dice games, crosswords, and Scrabble. For more commercial dice games, using specially marked dice, see Collectable Dice Games. Steve Jackson Games produce a range of games, including a number of dice games. For more details, see Steve Jackson Dice Games.